Straus had tried to push all of his chips on the second day of the tournament, lost the hand, then discovered a single $500 chip that had been hidden under a napkin. Since he hadn’t verbally declared “all in”, he was allowed to remain in the tournament. His comeback to win the event coined the phrase “a chip and a chair”. 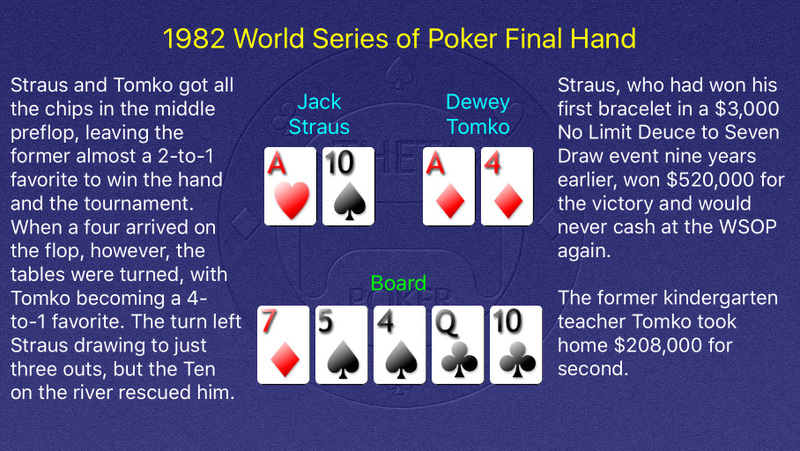 Duane “Dewey” Tomko had already won a WSOP bracelet in a $1,000 No Limit Hold ‘Em event in 1979 and would go on to win two more, in a $10,000 Deuce to Seven Draw event and a $5,000 Pot Limit Omaha event in 1984.